We have crop and livestock projects on our land. We use the projects to educate and mentor the children and other locals in our area. 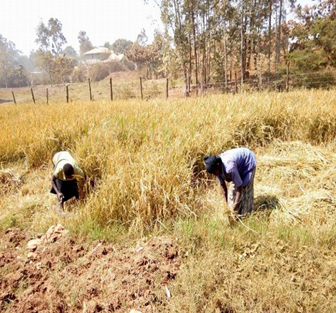 Our intent is to use the crops to feed our children at the House of Grace and to generate income. Our new land in Namusi Uganda, outside of Mbale, is where we do our crop and livestock projects. 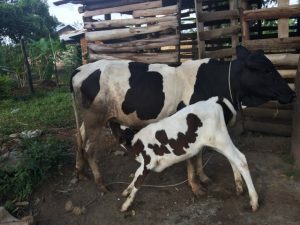 We have cows and goats that we use to teach the children to raise and harvest their own meat for the orphanage property. We have 11 goats. Our cow Suzie recently had a baby calf and we’re expecting another cow soon. We are looking for people to help us by donating seed for crops also. We are also looking for teams that want to come into Uganda to plant and help us with the livestock projects. Please contact us if you are interested in donating a chicken, pig or goat to our ministry or want to be a part of a team coming in. 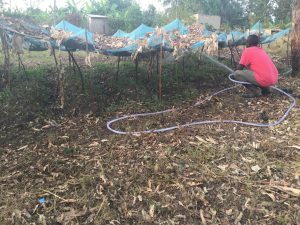 We are preparing, cultivating, and harvesting the seed for this project and recruiting local villagers to help us. We are also teaching the children how to plant and harvest their own food. This project provides food for the children, income for our ministry, and work for the local villagers. Please consider contributing to this cause. In addition to our crop and livestock projects, we also work with local widows and help them with in various farming techniques. 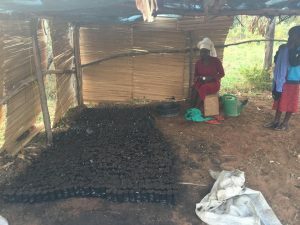 We’re doing a mushroom project, hydroponics and something awesome called Farming God’s Way with our widows.Learn more about the Warrior Widows Project here. As part of our crop projects we are growing coffee, which we call Higher Ground Coffee. We’ve planted 5,000 coffee plants which will take 3 years to reach maturity. Once they’re ready, we plan to harvest the beans and sell. Find many more pictures of our land and our crop and live stock projects in our photo gallery.